We’ll catch up with the Fourteenth Connecticut next week. 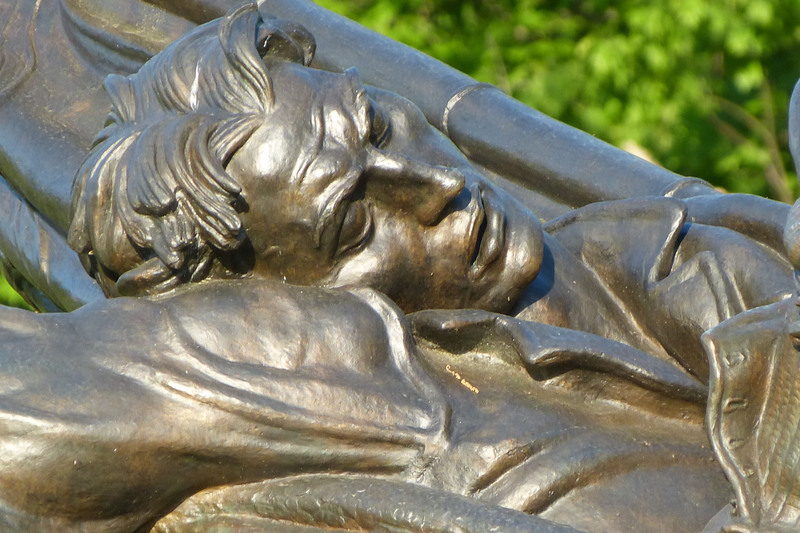 During a visit to the Gettysburg battlefield in May of this year, I photographed many of the monuments. I found the monuments depicting the men of both armies particularly striking. Hover your pointer over each picture for a short description. I hope you enjoy them. This entry was posted in 1863, Battles of the 14th, General Information, Gettysburg Campaign on July 26, 2013 by admin. Captain Samuel Fiske (Co. G, 14th CT Vol. Inf.) was not with the regiment during the Battle of Gettysburg. 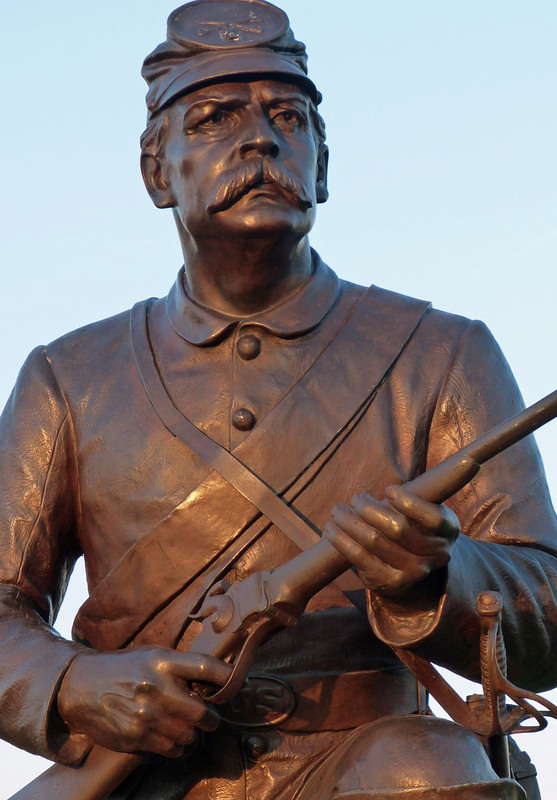 He was serving on the staff of Col. Samuel Carroll’s 1st Brigade, 3rd Division, 2nd Corps. This brigade was sent to support the 11th Corps on Cemetery Hill on July 2, and saw heavy fighting in defeating repeated assaults by Ewell’s Corps of Confederates late that day and early on July 3. Fiske’s writings are full of praise for Col. Carroll and the gallantry and conduct of the Army of the Potomac. Yesterday, I expected to enjoy the most glorious anniversary of its national independence the country ever saw. But it proved to be the most anxious and finally miserable day I ever spent, for we did absolutely nothing! Gen. Meade has shown such skill and ability hitherto, that we are all inclined to trust him to the uttermost; but how can it be that he has not lost the most glorious opportunity of the whole war? The men universally were eager, anxious, panting to be led on to complete the triumph and utterly crush the defeated and despairing enemy. They were like hounds on the leash, panting to be let loose. And then it was Independence Day! Good Heavens! We could not be defeated that day. I would stake my life a thousand times over on the issue. I know Gen. Meade and not I is the one who has disposed the troops and guided them to victory…. Even if he doesn’t let a remnant of the army of Lee get back across the Potomac, I shall still contend that the work of annihilation were better done yesterday. This morning we learn that his (Lee’s) artillery has been moving all night, and I suppose there is scarcely a shadow of doubt the old fox is gone. Indeed, Meade was widely criticized for his slow pursuit of Lee. At Williamsport on the Potomac, Lee’s army was trapped for a week, from July 6 to July 13, because Federal cavalry had destroyed his pontoon bridges and high river water prevented them from being rebuilt. 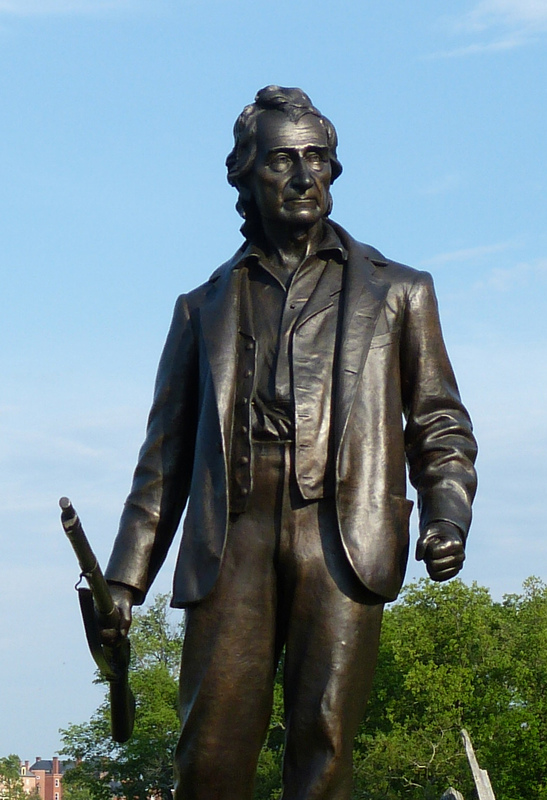 Union troops arrived in force on July 12, and before they could deploy and prepare a vigorous attack, Lee’s army had escaped across the river. The Confederate army would live to fight again. This entry was posted in 1863, Battles of the 14th, Gettysburg Campaign, Men of the 14th on July 19, 2013 by admin. Infantrymen of the Army of the Potomac rarely complained of not having enough to eat, because the army usually supplied them with sufficient marching rations. (Readers may remember that Sgt. Hirst wrote to his wife that he had gained twelve pounds since leaving home.) It was normal for the troops to carry three days marching rations of hardtack, salt pork, and coffee. As far as I have been able to determine, the last time the men of the Fourteenth drew rations was on July 1st at Taneytown, so their last meal from that supply was probably eaten after the battle on Friday, July 3rd. 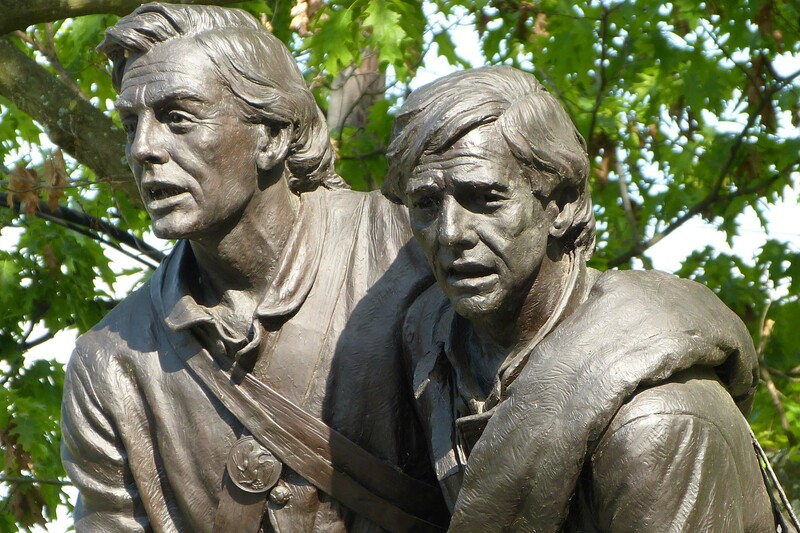 Imagine the growing concern the day following the astounding Union victory when the men of the Fourteenth Connecticut reached into their haversacks only to find them empty. It was still full alert with arms at the ready along the rock wall, because the Confederates had sent out a strong skirmish line toward the Emmitsburg Road to cover Lee’s preparations to withdraw his army. So where was the supply train that carried the vital food supplies for the Fourteenth Connecticut? When the news of the fighting on July 1st reached Taneytown, the brigades of infantry left their supply trains behind and hastened toward Gettysburg. Heavy rains on July 4th made the roads impassible, so the rations for the men of the Fourteenth were probably lost in the jumbled mass of horse-drawn vehicles clogging the Taneytown Road from Taneytown to Gettysburg. During the afternoon of Sunday, July 5, the regiment left its position at the rock wall and marched on empty stomachs about five miles down the Baltimore Pike, instead of the Taneytown Road, to the village of Two Taverns. The men remained at Two Taverns on Monday, but there was still no sign of their food. On Tuesday, July 7th, they marched again, about ten miles to Taneytown. Forage details were sent into the village to purchase food, if any was available, on the promise of reimbursement from the Federal government, and a loyal citizen sat by his well pump selling water to the weary passing soldiers for six cents per glass. As evening came on, and the prospects of ending yet another day without food, the supply train finally appeared and rations were quickly distributed to the hungry men. The siege upon their stomachs and morale was lifted. Now it was time to pursue the retreating Confederates. Check This Out: A fascinating article about Gen. Alexander Hays, commander of the division of which the Fourteenth Connecticut was a part, in The Gettysburg Compiler. This entry was posted in 1863, Gettysburg Campaign, Men of the 14th on July 12, 2013 by admin. Friday, July 3, 1863 became a hallowed day for the Army of the Potomac, and most particularly for the Second Corps, which bore the brunt of the fighting that afternoon. 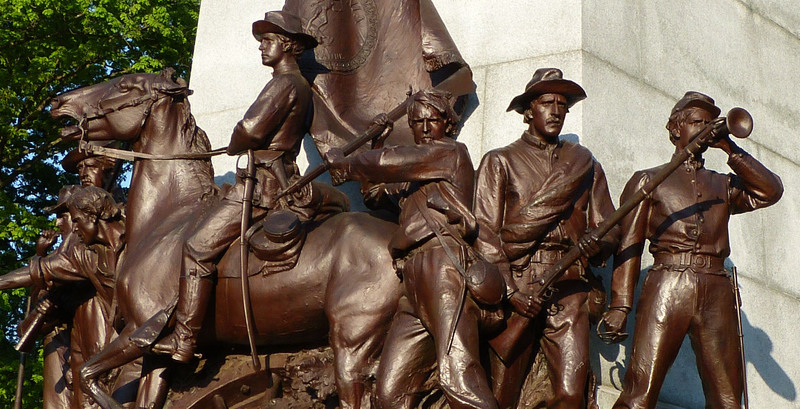 The Confederate assault had been determined and courageous, but the men of Gibbon’s and Hays’ Divisions were equally determined to yield no ground. For once they were not out-generalled. They had been led well. The ground they fought on had been chosen wisely. The most prized possession of any Civil War regiment was its colors (flags). They were to be defended at all cost, and for a regiment’s colors to be captured by the enemy was about the worst possible thing that could befall the regiment. (The Fourteenth’s own colors were saved at Fredericksburg only through the heroism of two men.) 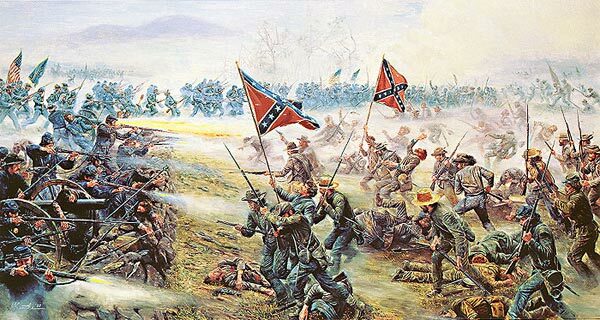 During the repulse of Pickett’s Charge, the men of the Fourteenth captured the colors of five regiments: 16th North Carolina, 52nd North Carolina, 1st Tennessee, 14th Tennessee, 14th Virginia. The Fourteenth Connecticut is also credited with capturing over 200 prisoners, some of whom were amazed at how few men had defended that portion of the wall. Casualties of the Fourteenth: Despite the two separate actions on July 3rd at Gettysburg, only a single casualty count was reported. The regiment arrived at Gettysburg with about 166 men fit for duty. Their losses were 10 killed, 52 wounded, and 4 missing. We know that the 4 missing were captured from the skirmish line, one was killed at the Bliss barn, and about half those wounded were during the Bliss action as well. 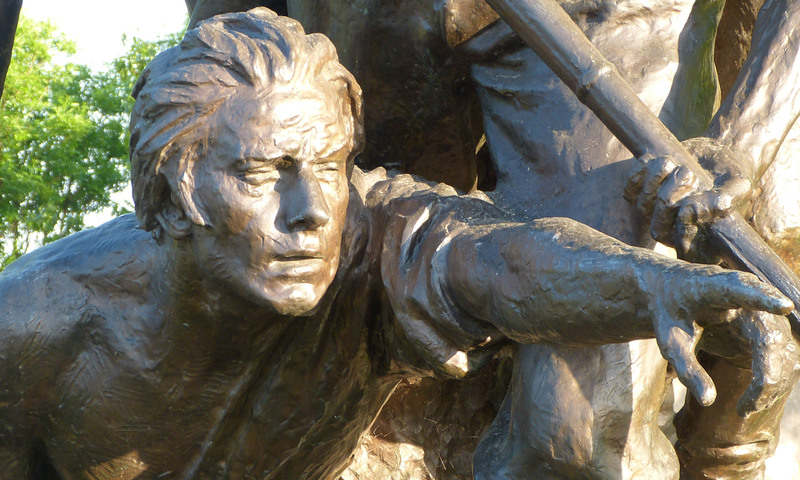 That puts the casualties during Pickett’s Charge at 9 killed and about 26 wounded. Total loss to the regiment: 66. Among the injured was Sgt. Benjamin Hirst. When the last Rebel assault was broken and the shattered remnants of the once proud lines of gray and butternut began to stagger back toward seminary ridge, the Confederate artillery opened up again to discourage any pursuit by Union troops. One of these shells struck the base of the rock wall near Hirst, dislodging a rock that struck his right shoulder blade. Unable to take pen in hand Ben’s brother John wrote Ben’s beloved Sarah to tell her Ben would recover, but as Ben later wrote: “While I was rejoicing with them (the boys), I was sent rolling in the dust being hit for the third time upon this eventful day and was this time dabled (disabled) for ever carrying a gun in active service again.” After recovering, Ben Hirst was transferred to the Veterans Reserve Corps for the remainder of the war. Oh yes. Remember Sgt. DeForest’s chicken that was put in the stewpot just before the Confederate artillery opened fire before Pickett’s Charge? When the firing stopped and the smoke had cleared, there was no sign of the chicken. Perhaps the men of Arnold’s Rhode Island battery repurposed the chicken. This entry was posted in 1863, Battles of the 14th, Gettysburg Campaign on July 5, 2013 by admin. 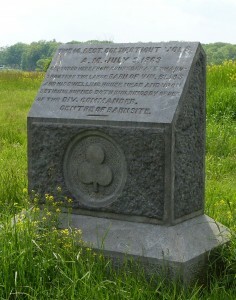 The stone marker in the above photo marks the right flank of the Fourteenth Connecticut Volunteer Infantry on July 3rd, 1863 at Gettysburg. About one hundred and twenty men defended this section of the rock wall, one hundred fifteen paces in length, to the right flank of the 71st PA near the angle in the wall. The famous “copse of trees” is at the left edge of the photo. One man for every three feet of wall. How did they do that? At left is detail of a very good map of Pickett’s Charge from civilwar.org. (Click for full map.) It clearly shows the deployment of Smyth’s Brigade. The map also shows Arnold’s Battery of Rhode Island artillery separating the 14th CT from the 71st PA when in fact the left flank of the 14th connected with the right flank of the 71st, “elbow to elbow,” as Sgt. Benjamin Hirst wrote. (According to some accounts, this battery arrived late in the fight and helped repulse only the third and final Confederate line.) The map correctly shows the position of the Sherrill’s Third Brigade in reserve behind Smyth’s. About noon commenced the Fiercest Cannonading I ever heard, the shot and shell came from Front and Right and Left. It makes my Blood Tingle in my veins now; to think of. Never before did I hear such a roar of Artilery, it seemed as if all the Demons in Hell were let loose, and were Howling through the Air. Turn your eyes which way you will the whole Heavens were filled with Shot and Shell, Fire and Smoke. The Rebels had concentrated about 120 Pieces of Artilery upon us and for 2 long hours they delivered a Rapid and Destructive fire upon our Lines, Principally upon the old Second Corps whom they desired to attack. To add to all this was our own Batteries in full Blaze, every shot from which seemed to pass over our heads; it was a terrible situation to be in between those two fires; how we did Hug the ground expecting every moment was to be our last. And as first one of us got Hit and then another to hear their cries was Awful. And still you dare not move either hand or foot, to do so was Death. Our fire began to lose its vigour…and as the Smoke lifted from the Crest we saw our Guns leaving one after the other and soon a terrible stillness prevailed so that you could almost hear your heart thud in your bosom. But what means that shout of derision in our Front. Up men the Rebels are upon us, there they come a Cloud of Skirmishers in front, with one, two, three lines of Battle, stretched all along our Front with their Banners flying, and the men carrying their Pieces at trail Arms. It was a Glorious Sight to see, Rebels though they were. They seemed to march as though upon Parade, and were confident of carrying all before them. We take to our feet; we are driven in, but not in confusion. Sometimes we about Face and return their Skirmishers ﬁre. But still we fall back up the Hill and over the Wall bringing our wounded with us. As we fell into line Brigham fell in with Company A on account of getting cartridges for his Sharps rifle. About one-half the regiment had this rifle. And now We have a short breathing spell and can Note the Intense anxiety depicted on every countenance. The Fate of the whole Army now rests with you. And time it was too, for the Rebels seemed to me to be within 150 yards of us, just crossing the fences on the Emmitsburg Road, and we could hear their Ofﬁcers pressing them on to the charge. Fire, Fire, Fire, all along our Line. There opened upon them such a Storm of Bullets, Oaths and Imprecations as fully satisﬁed them we had met before, under circumstances a little more favourable to them. Give them Hell.Now We’ve got you. Sock it to the Blasted Rebels. Fredricksburg on the other Leg. Hurah, Hurah, the ﬁrst Line is broken. Never mind who is Hit. Give them Hell again. And soon the second Line is sent Howling back after the ﬁrst one. “Right Oblique! Fire!” “Left Oblique! Fire!” And the supporting Colums are thrown in disorder and soon seek safety in Flight. At this time a great number of the rebels threw up their hands in token of surrender and we allowed them to come in, disarming them as they reached the wall. Others defiantly essayed to advance, but opposite the old Fourteenth, none could get over a low rail fence a short distance in front of the stone wall without our permission. The color bearer of the 14th Tennessee, with not a man of his regiment within a rod of him advanced steadily until he reached this fence, when he rested his colors before him, then drew himself up to his full hight, looking us calmly in the face. There he stood for several awful moments, when the sharp crack of two or three rifles fired simultaneously sent his brave soul to its Maker. Just as the color bearer of the 14th Tenn. was shot, several of our men jumped to their feet with the intention of getting the colors but were restrained by the ofﬁcers until Major Ellis buckled his side arms upon Sergt. Major Hincks and gave him the preference of bringing them in. Then you ought to have heard the Exhultant Shouts of our Brave Boys as the whole Rebel Force gave way in utter confusion leaving thousands and thousands of Killed, Wounded and Missing in our hands. What a sight it was, where but a short time before had stood the Flower of the Rebel Army in all the Pomp of Pride and Power was now covered with Dead in every conceivable Posture, and such a Wailing Cry, mingled with Groans of the Dying is past conception. Oh for a thousand or two fresh men to charge upon the discomfited Foe, and push them Home. Could this have been done the Southron Army might have been Anihilated. One man for every three feet of wall. How could so few ever have expected to defeat wave after wave of Confederate infantry? Hirst’s description provides several clues. His deep distrust and loathing for most officers has been replaced with respect and admiration. There is belief in the cause and belief in victory. There is anger in his words about the enemy, but there is determination to see the foe defeated. He also mentions the Sharps rifles. With half the regiment armed with these rifles, they would have produced the effective firepower of two or three times their number. So rapid was their firing that their rifles became almost too hot to handle. 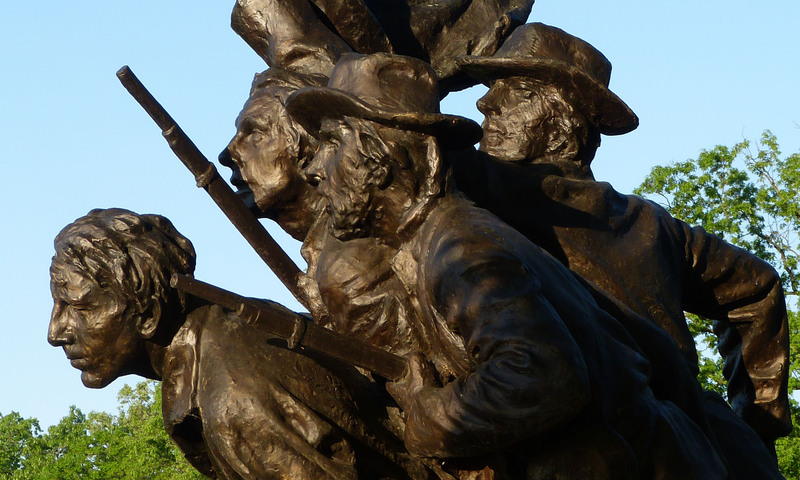 The following image is of Mort Kunstler’s “High Water Mark.” A detailed examination reveals that the Union men in the foreground belong to the Fourteenth Connecticut and that they are armed both with Sharps and Springfield rifles. Click on the image to visit the artist’s website and read his description of the painting. This entry was posted in 1863, Battles of the 14th, Gettysburg Campaign, Men of the 14th on July 3, 2013 by admin. This is where the “fog of war” comes into play. Col. Smyth rode with this detail alongside Lt. Seymour (Co. I, 14th CT) as far as the Emmitsburg Road. “If in the event of our capturing the house and barn the rebs make it so hot we can’t hold them, shall we fire (burn) them?” Seymour asked. “We don’t know the word can’t!” Col. Smyth replied, but moments later he amended his order. “If they make it too hot for you,” the colonel said, “burn the buildings and return to the line.” No one else heard this conversation, and almost as soon as the dash to barn commenced, Seymour was struck seriously in the leg and was unable to communicate this last order to anyone. Capt. Moore reached the barn first, just in time to see the backs of the fleeing Rebels. But the swift seizure of the barn also meant that the Connecticut boys were trapped. Confederate artillery opened up on the barn from only 500 yards. One man was killed outright, others were injured. The remaining four companies on the ridge were ordered to reinforce them and capture the house. Major Ellis commanded this detail. A second mad dash and several more men fell along the way, but most made it through the gauntlet. Some ran for the barn, others for the farmhouse. Now, better than a hundred men were trapped at the farm under constant fire from musket and artillery. But they were men who followed orders. They had taken the farm and they were determined to hold it.” The photo below shows the Bryan farm from the site of the Bliss farm. Gen. Hays had seen enough. He asked for a volunteer to relay an order to burn the farm buildings to Maj. Ellis. Capt. Postles of Col. Smyth’s staff stepped forward. He was an expert horseman, and his horse was powerful and swift. He thought it a suicidal mission, but spurred his mount across the half-mile of open fields through the crossfire of the enemy fire to the barn. Once there, he kept his horse always in motion, dancing and prancing and rearing to foil the Rebels’ aim, while he shouted the order to Maj. Ellis. Then Postles sped off toward the Union line. Upon his safe arrival this act of individual courage was cheered by both sides. The barn and farmhouse were soon in flames and the men of the Fourteenth were scurrying back across the Emmitsburg road bringing all their wounded with them, as well as their one dead comrade. Estimates of the total loss to the regiment at the Bliss farm was about thirty. One final and rather amusing incident was related by Chaplain Stevens. A certain Sgt. DeForest spied a chicken racing about the Bliss farmyard. After a vigorous, though brief, pursuit amid constant musketry and shell fire, the chicken was captured. 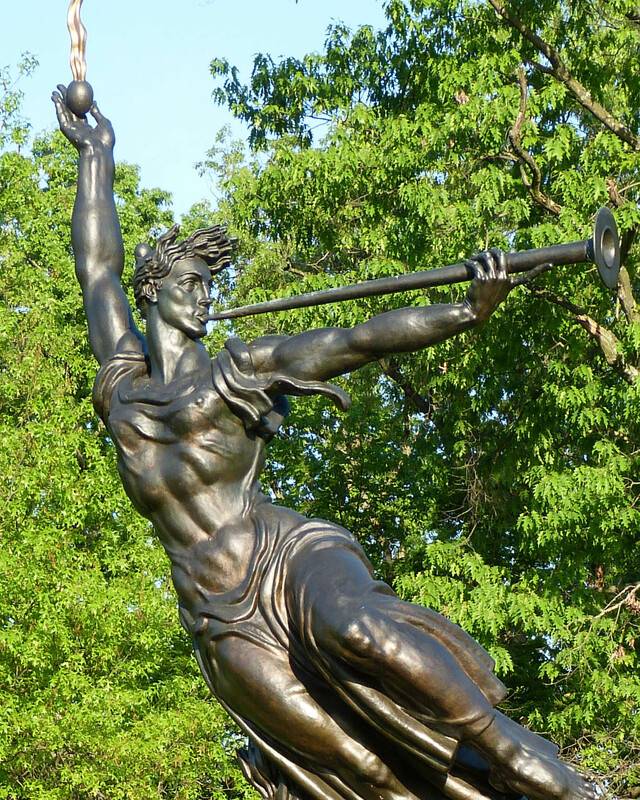 The victor carried his mouth-watering prize back through heavy fire to Cemetery Ridge, where the chicken was dispatched, gutted, plucked, and put in a large pot to stew for awhile. A short time later two single shots from Confederate guns were fired, signaling the start of the heaviest artillery barrage of the war. DeForest’s friends would have to wait to enjoy their chicken stew..
A thorough analysis of the fighting around the Bliss farm is Elwood Christ’s The Struggle for the Bliss Farm at Gettysburg. Chaplain Stevens account may be found in his Souvenir of Excursion to Battlefields by the Society of the Fourteenth Connecticut Regiment, 1891, which is available electronically online..
After a predawn march, the men of the Fourteenth Connecticut (Second Brigade, Third Division, Second Corps) arrived at Cemetery Hill at about 5:00 a.m., Shortly before, the new commander of the Army of the Potomac, Maj. Gen. George Meade had arrived. The trust he had placed in Gen. Hancock the day before paid huge dividends. 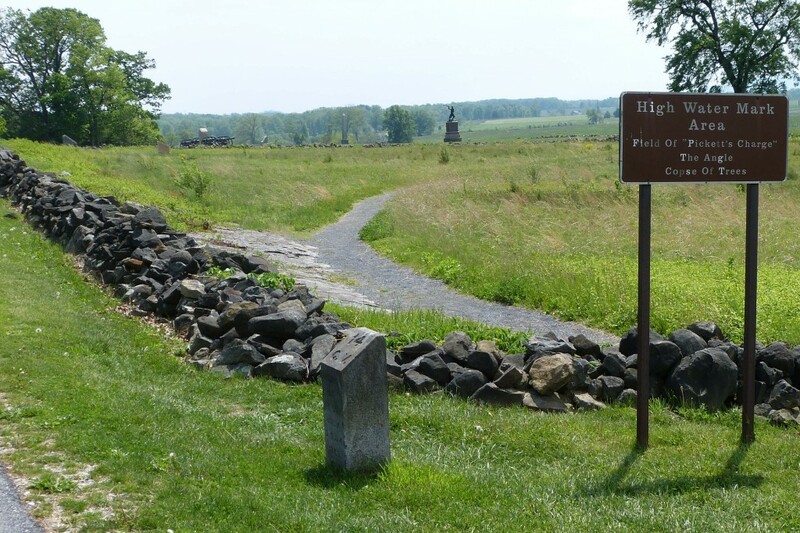 The army was dug in on high ground south and east of the town of Gettysburg. Despite the reverses of July 1st, the troops were in fine spirits, and the remainder of the army was coming up quickly. Even those with only a passing knowledge of this battle know that the Union line at Gettysburg resembled a large fishhook. (Click for Wikipedia map.) The curved portion wrapped around Culp’s Hill (Twelfth Corps) and Cemetery Hill (Eleventh Corps) with the First Corps in reserve. 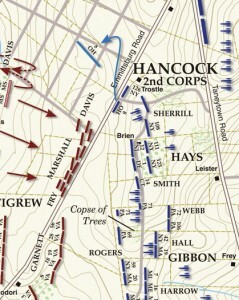 The Second Corps deployed to the left of the Eleventh Corps, extending the Union line of battle southward along the western slope of Cemetery Ridge, and thus starting the straight shaft of the fishhook. The divisions were deployed as follows. Right (north): Brig. Gen. Alexander Hays’ 3rd Division (14th CT in 2nd Brigade). The right flank connected with the Eleventh Corps. The line of battle was centered on the Bryan farmhouse and extended south along a low rock wall The left flank was at the stone wall near the Bryan House. While the rest of Hays’ Third Division dug in along the low rock wall, the Second Brigade, under the command of Col. Thomas Smyth and including our friends in the Fourteenth Connecticut were deployed in support of Woodruff’s Battery I, 1st U.S. about two hundred yards behind the rest of the division. For those familiar with the Gettysburg battlefield, this was approximately on the site of the old Visitor’s Center. Nothing much of consequence occurred until later in the afternoon when Maj. Gen. Sickles decided without orders to advance his Third Corps to take some high ground between Union and Confederate lines. Longstreet counter-attacked and pitched battle raged back and forth at places with names hallowed by the bloody fighting that afternoon and evening—the Wheat Field, the Peach Orchard, Devil’s Den, the Slaughter Pen. Suddenly, the men of Caldwell’s Division were on their feet and moving off at the double-quick in support of the Third Corps. Many would not return. Gibbon’s men shifted to the left and those held in reserve, including the men of Col. Smyth’s Second Brigade, were brought forward to plug the gap. 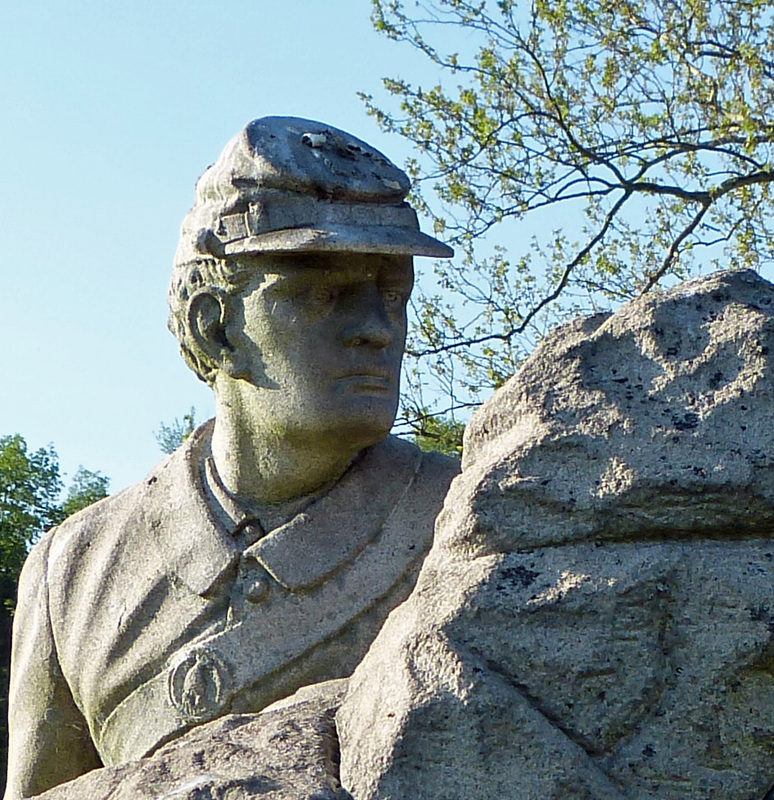 The men of the Fourteenth Connecticut were now in the front line. Two companies went forward across the Emmitsburg Road as skirmishers. The rest dug in the earth behind the low rock wall and did what they could to secure their new position. About two-thirds of the way across the shallow valley between Cemetery Ridge and Seminary Ridge, Rebel sharpshooters occupied the barn and farmhouse of a man named William Bliss. The Rebels began to fire on the Union lines, paying special attention to artillerymen. A nasty little fight developed when Col. Smyth sent out a detachment of the 12th NJ to drive the Rebels away, but as soon as the boys in blue returned to their lines, the butternut sharpshooters returned to their deadly work. Darkness ended the fighting to the south. Late that night, Ewell’s Corps of Confederate troops tried repeatedly to storm up Culp’s Hill, but every time they were repulsed with heavy losses. The First Brigade of Hays’ Third Division was sent to support the Eleventh Corps, leaving only the Smyth’s Second Brigade to hold the Third Division’s line on Cemetery Ridge, with the Third Brigade in reserve. On Thursday, July 2nd, the men of the Fourteenth were more spectators than participants in the grand drama that swirled all around them. But on July 3rd they would no longer be spectators. In fact, their battle card would be quite full, so please look for two posts tomorrow. This entry was posted in 1863, Battles of the 14th, Gettysburg Campaign on July 2, 2013 by admin.